BMC is proud to celebrate the role our nurses play in delivering the highest level of quality care to our patients. Our nursing staff provides care for countless patients and families, offering the highest levels of comfort during their time here at BMC. This year, we received a variety of nominations submitted by BMC patients and staff, explaining why their favorite nurse should be chosen. This year, we are proud to recognize Patti. "My fiancé, Robert, stayed at Boston Medical Center for about a month, from mid-January to mid-February this year. He was in SICU with a severe disease. I visited him as often as I could. On February 3rd, we were told that his condition had suddenly gotten worse and that he might not make it through the night. His family and I rushed to his bedside and spent the night there. We were deeply heartbroken. We were shocked. He was only 55, and up to that point had been quite healthy. We took turns, saying our goodbyes, reasserting our love to him. It was a very straining night, everything felt surreal. We had been trying to sleep on the chairs, but it was too difficult to find any sleep. We quickly learned that it was only a matter of time. There was almost no possible way for my fiancé to pull through. At 6am, Patti came in and took care of Bobby and us. She made sure to order a cart with muffins, coffee, orange juice, and water. She answered our questions, the medical ones, and the more delicate ones. Her kindness, understanding, and accessibility felt reassuring to me. She was supportive on the psychological level while being honest as to Bobby's condition. That Sunday, I stayed at the hospital all day. I could see Patti had a lot on her plate, she was running around taking care of many patients. But Bobby received all the care and attention he needed. Most importantly, she kept smiling. I stayed over one more night at the hospital. At the time, all I wanted was to be able to be by my fiancé's side no matter what happened. I barely slept, barely ate. It was Patti who told me and convinced me that it was okay for me to take a break. On February 13th, Bobby passed away. I would like to point out that, even though I nominated Patti, the entire staff was extremely kind and helpful throughout Bobby's stay. If it were possible, I would nominate the whole SICU staff for their professionalism. I chose Patti because I saw her the most and she handled difficult situations with a tremendous amount of tact and stayed professional at all times. 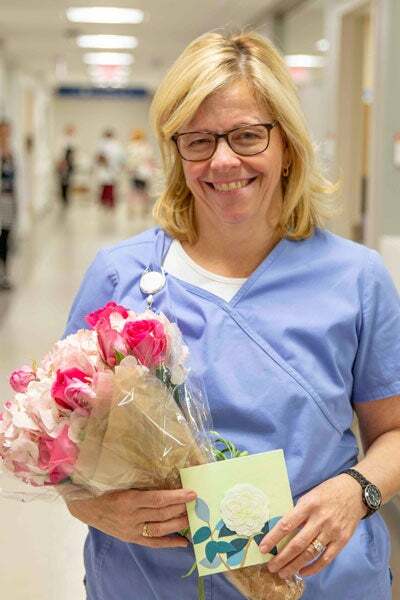 To me, this story highlights the comforting, positive impact that accessible, kind, trustworthy nurses like Patti can have on grief-stricken visitors." Patti was surprised with flowers and a card containing Clotide’s nomination, in honor of National Nurses Week. Each year, Nurses Week recognizes the incredible contributions made by nurses. Nurses Week takes place from May 6 through May 12, which is also the birthday of Florence Nightingale, who is considered the founder of modern nursing. Thanks to all who participated in this year’s contest, and congratulations again to Patti!